I love pretty things, I truly do. 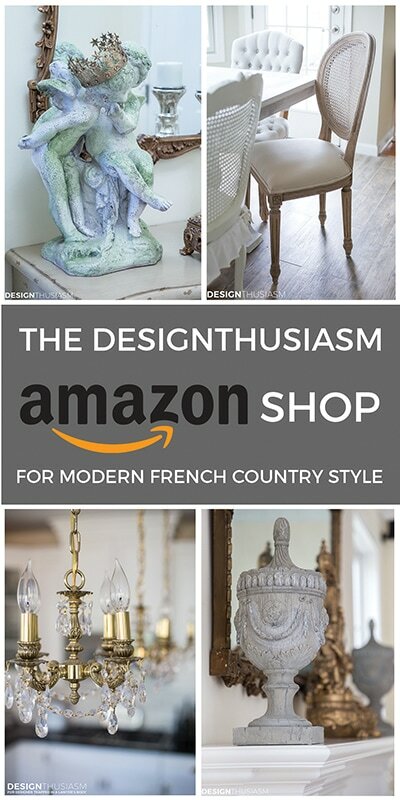 But as much as I love the pretty, I also feel that every furniture purchase is an opportunity to solve at least one or two problems. Chief among them, in most homes, is the challenge of storage. 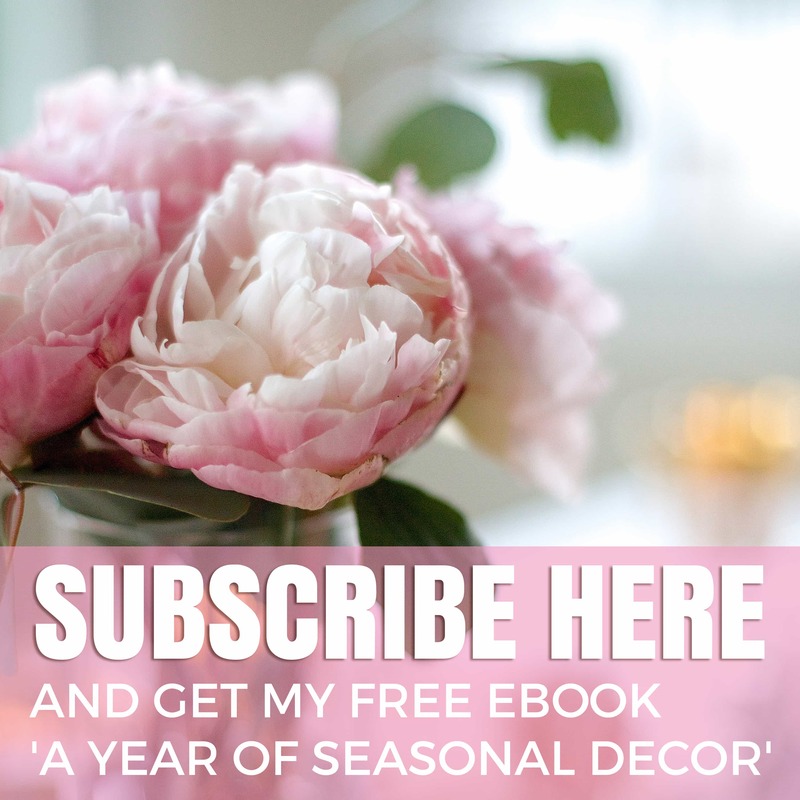 So when we were decorating our master bedroom in our new home and it was time to work out what I’d use as a dressing table, I wanted something that provided more than just a few tiny drawers. This is why I use a writing desk as a vanity. Ok, to be fair, it’s more than just a writing desk. It has a hutch, as well. 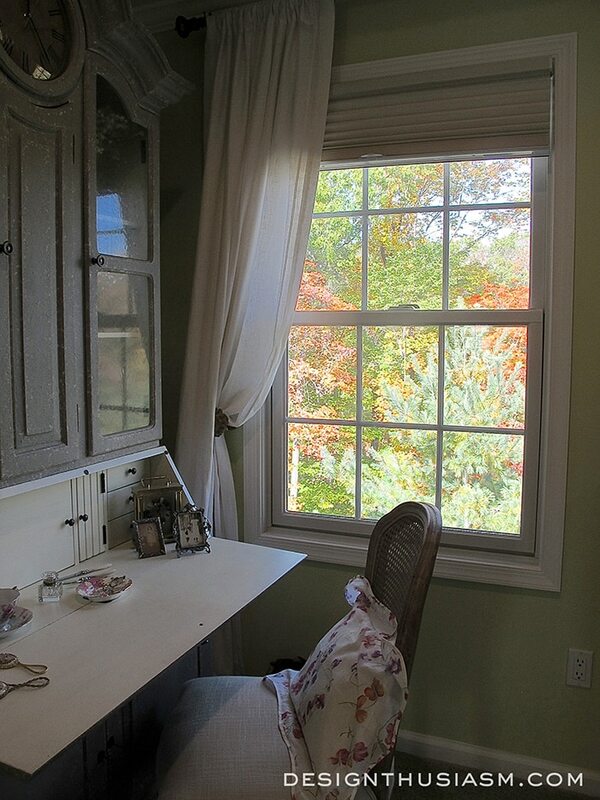 But I love the look of a writing desk and the nooks and crannies it offers. I keep tissues behind the little doors and cosmetics in the pull out drawers. 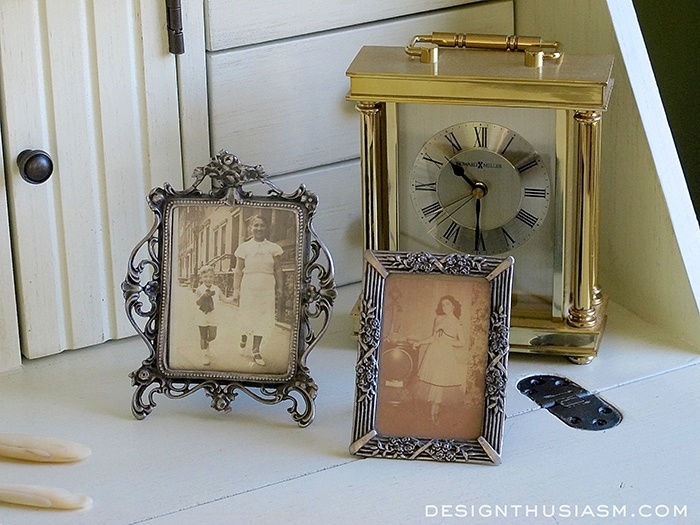 But mostly I love the small vintage pieces that add charm to the surface of the desk. 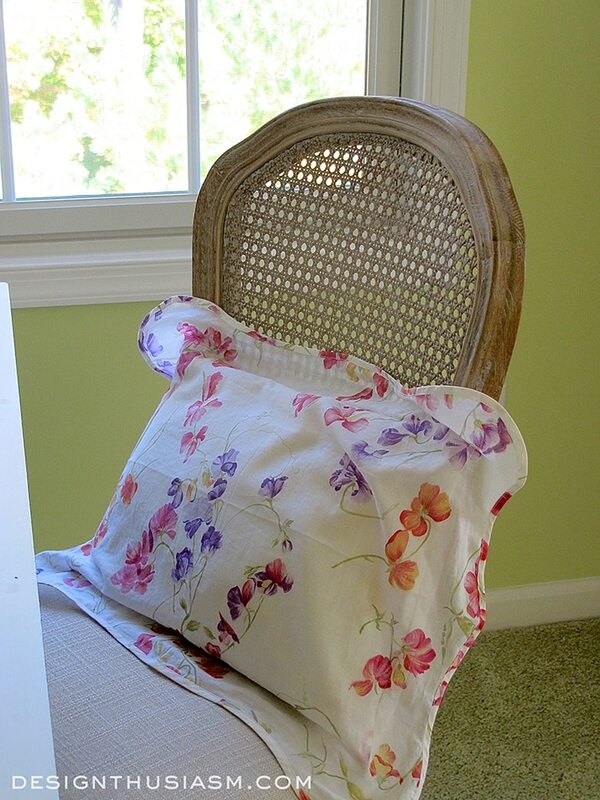 My chair is a little painted cane back chair with a pretty boudoir pillow tossed on for comfort. 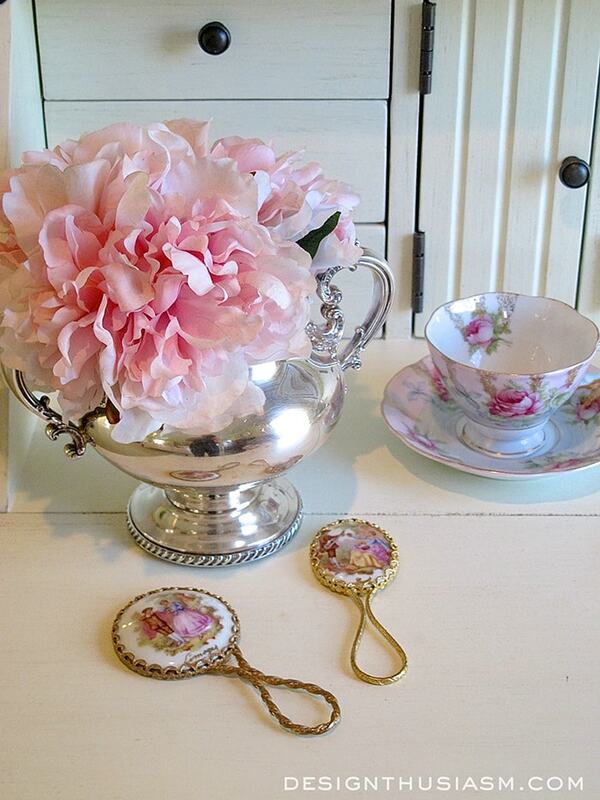 Almost all of the pieces that grace the writing surface are vintage, from the silver sugar bowl used to showcase florals to the pair of tiny hand mirrors that have been passed down in our family. 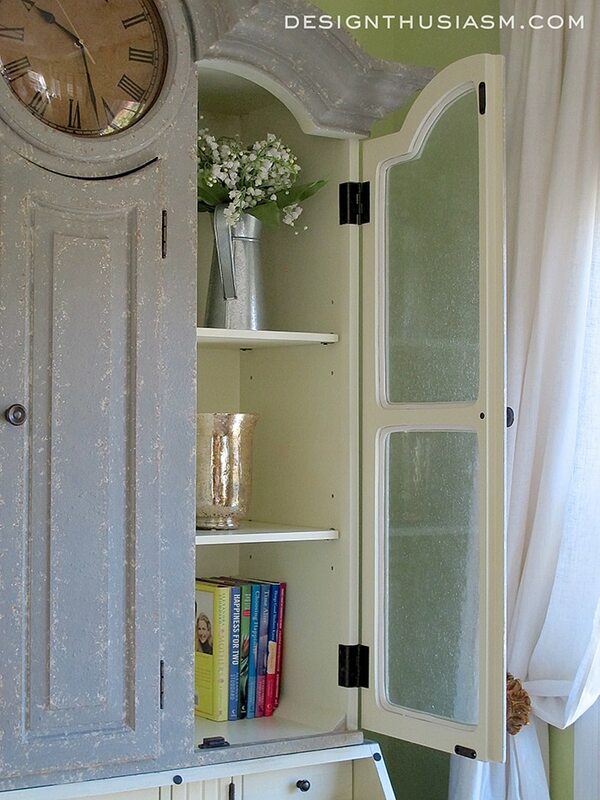 The hutch is a goldmine of extra storage which is a true privilege. Behind the glass panes I keep books and other striking things, whereas the wood doors hide the full breadth of the tools for my makeup routine. I enjoy displaying my collection of correspondence instruments on this type of desk. 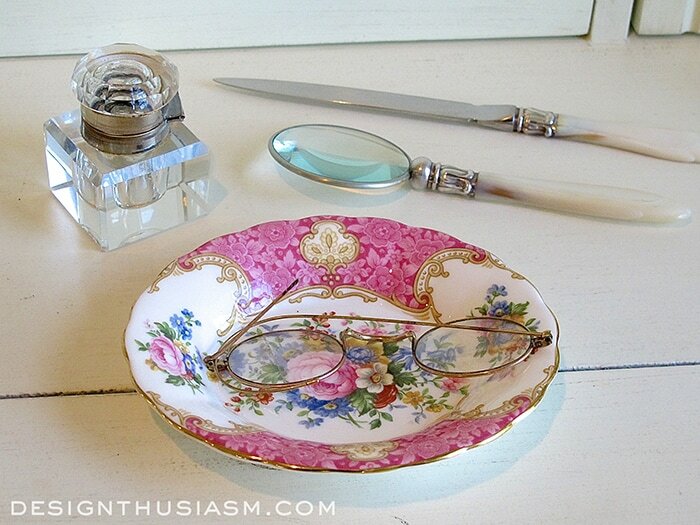 The crystal inkwell and mother-of-pearl letter opener and magnifier were found in an antique market in London. The view from this spot is delightful and a wonderful way to start my day. The lighting by the window is great for makeup application and I keep my mirror in the cabinet beneath the desk. 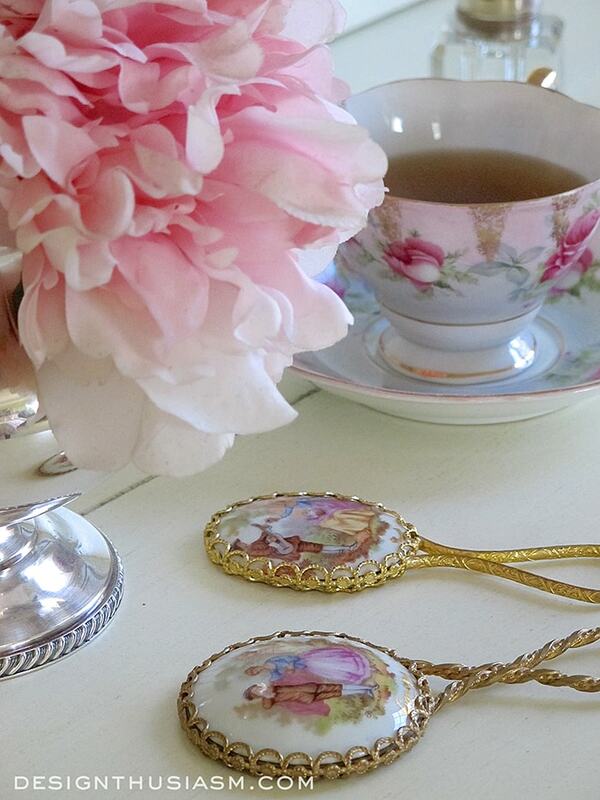 Ever present in my decor, a lovely teacup sits at the ready. I keep them in every room, but the place a cup of tea makes the most sense is right here, presiding over my morning routine. 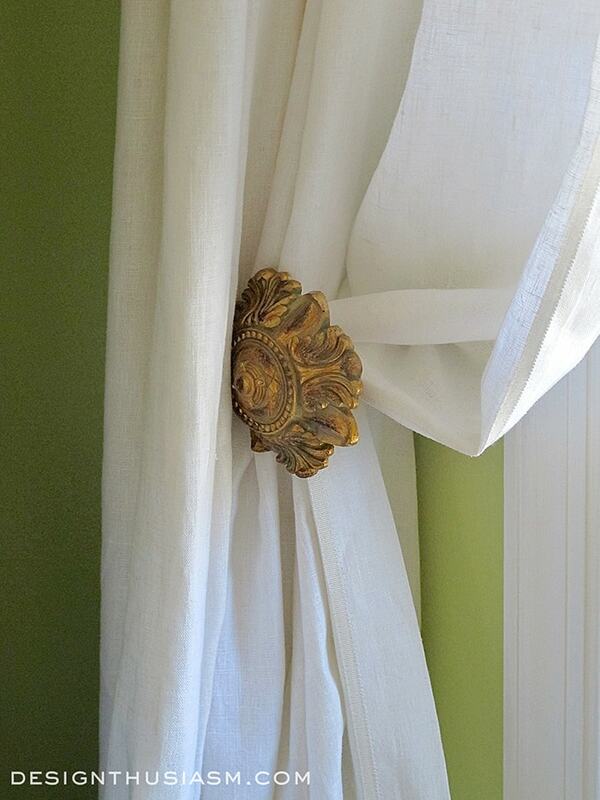 I’m not much of a heavy drapery girl, so these soft linen panels are perfect for my taste. We brought the gilded tie backs along with us from our last home, because I just love them so much. The desk is the Selma Secretary from Soft Surroundings (#affiliate link). The clock at the top is large enough for me to see from my bed across the room when I wake up in the morning. A pretty little trash can catches stray tissues and lip pencil shavings. 99 times out of 100 the tea in my cup is iced tea. True story. Hi, Lory. I absolutely love this idea, and placed by the window is so perfect. Beautiful piece of furniture whereby you can also display all your pretties. Love it! 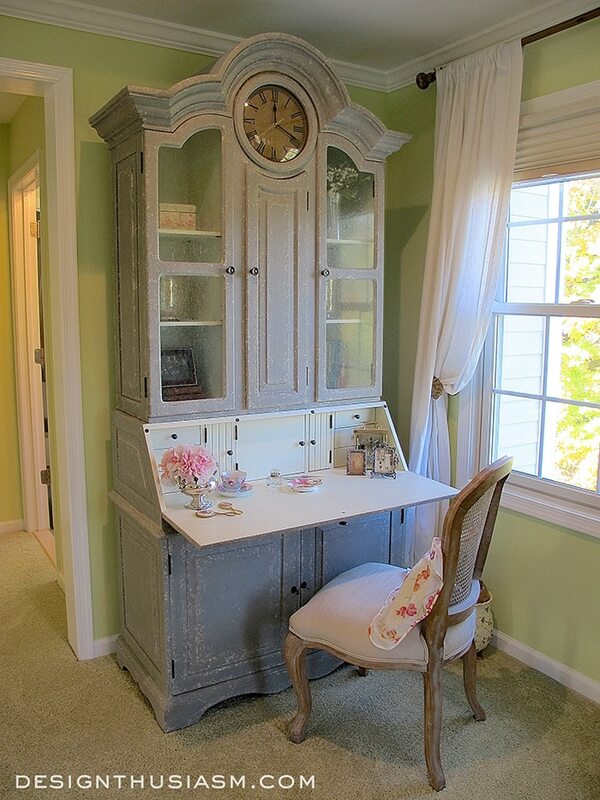 I had a French desk in my former master bath, but couldn’t use it here as I didn’t have enough wall space. Have been thinking of removing our spa tub that is rarely used just so I can place the desk there right under a window where I can get ready while sitting down. I love all your creative ideas and, like you, love multi-functional things. 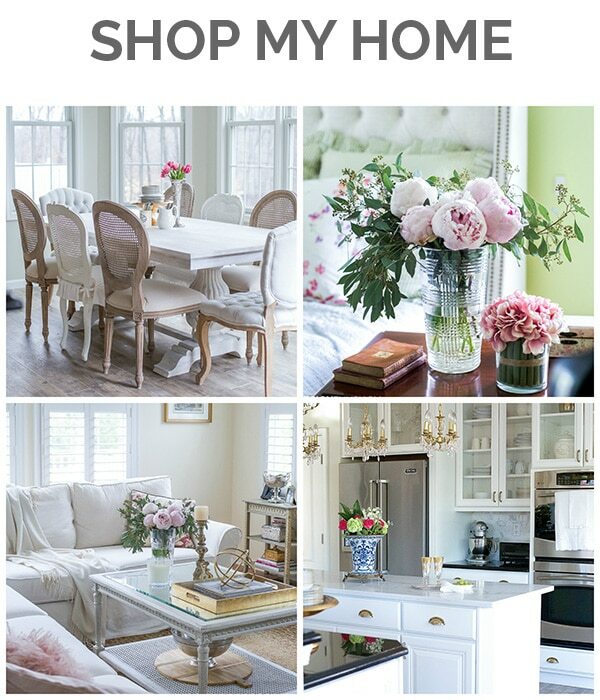 I was away on vaca so I didn’t respond to your kitchen redo blog. I know you want that white kitchen but I have to say that, if you never changed a thing, it still looks great; nice layout with many cabinets and work spaces nicely divided. Our kitchen cabinet color looks almost like yours…lol! I’ve thought of painting them a creamy white, but hubby really likes the cherry wood grain, so I don’t know about changing them now, especially since it makes him happy and he asks for so little. Hope you have a good evening. Thanks so much Bobbi! I actually wouldn’t mind the cherry in my kitchen if I had a light stone floor and prettier knobs, so that would be another way to go. But since I’ve wanted the white for so long, I’m going to try to make that happen… 😉 As for the desk, yes, I definitely believe that functionality is as important as beauty. Have you got any room in your bedroom for the desk? Maybe foot of the bed? I’d think twice about removing a spa tub because that, itself, has some really nice benefits. Even if rarely used, it sure is nice to use when you need to relax. (Have you ever seen my post about my master bath in the old house?) Sometimes I need to move things around a few times before I find the exact right spot for optimum functionality. Good luck!! Thanks for your input , Lory. We have a big master bedroom but every space is filled. I only have five feet from the end of our bed to the dresser front so I wouldn’t have room for the desk and a pulled out chair. I need to get a French bench to put there on which to place our folded bedspread each night. The only place I could put the desk would be on one side of the bed in the place of our nightstand and an angled French door propped in the corner near it, and I really like that look so much. I have two closets in the master, one being a walk-in that has room for a desk/vanity, but hanging clothes take away from the feel I’m going for…lol! I’m sure I’ll just store the desk to use when we move to our retirement cottage home we’re hoping to build one day, whereby I can plan a nice space for it. We down-sized two years ago and so much had to be sold, yet I just couldn’t part with that desk. Oh my goodness, how gorgeous! I would love to have such a beautiful space to sit and prepare myself for the day. Thank you for sharing this! Gorgeous! 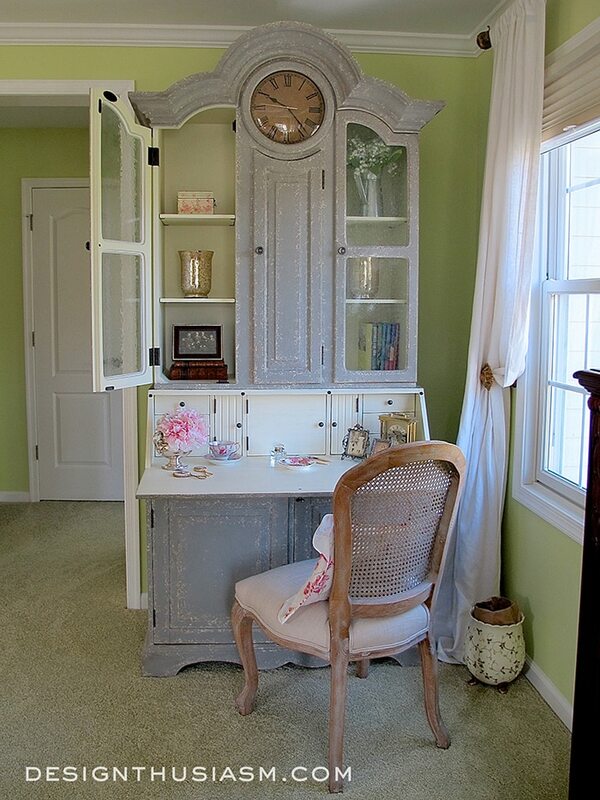 I’m hoping to do something similar in our master bedroom with a vintage dresser/desk. I love the way you made a unique piece of furniture extremely functional too! Thanks, Jenn!! 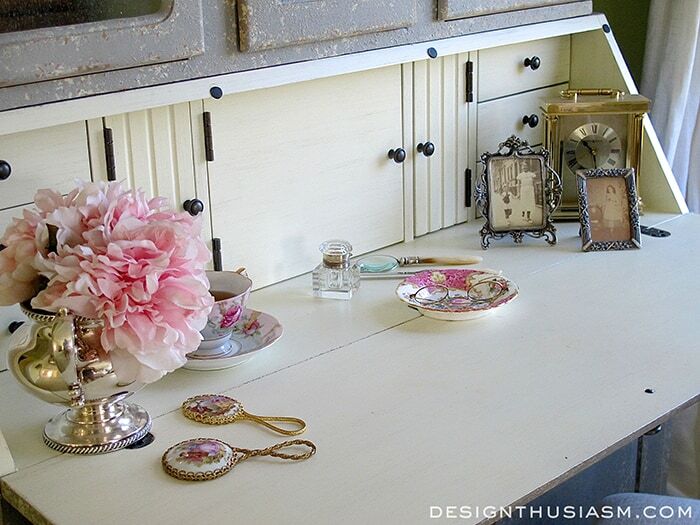 I seem to have a thing for writing desks, as I have 3 in my home… lol. I think I love that they have all these compartments and places to put pretty decorative items… 🙂 Thanks so much for stopping by and taking the time to comment! It truly is a beautiful and functional piece Lory! Love the idea of having a gorgeous spot to start the day with a breathtaking view! Thanks for sharing with SYC. Thanks, Jann! I really went back and forth between this and a regular desk, but ultimately all the nooks and crannies in the desk won out… 😉 Thanks for hosting!! 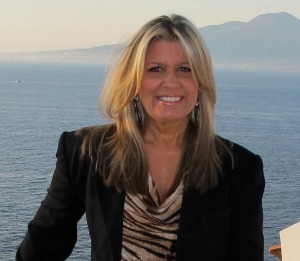 Hi Lory, just hopping back to let you know that I will be featuring you at SYC this week. 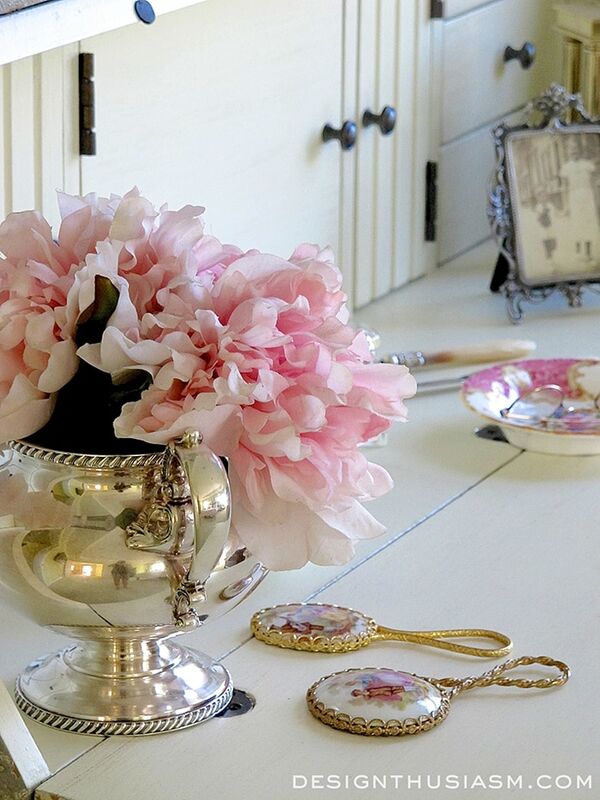 Love your pretty desk! Oh, thanks so much, Jann!!! So beautiful!!! All your accessories are elegant and pretty. Wonderful styling. Just beautiful, Lori. I have two secretary/writing desks and wouldn’t mind another if I had room for it. I wanted to ask if you can direct me to where I could find tie backs like yours? No wonder you took them with you from the move. Thanks, and sure, I’d be happy to share. 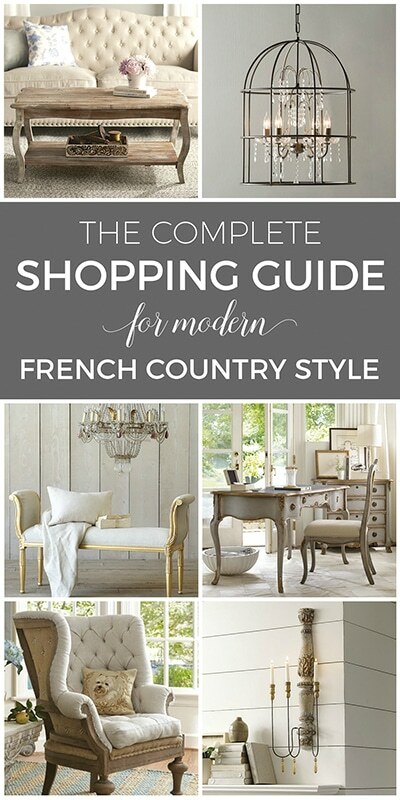 They are from the Paris Texas Collection and you can get them from the Continental Window Fashions website. I love this!! What a great idea! Your antique secretary is beautiful. What a beautiful piece of furniture. Makes you want to really get down and work!!! !